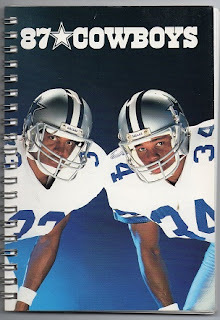 Though Tony Dorsett and Herschel Walker both appear on the cover of this 1987 Dallas Cowboys Media Guide, it wouldn't be long before only one would be in the Cowboys backfield. Despite his unquestioned success as a running back for Dallas, by 1985, Dorsett had achieved the reputation of a malcontent. He held out prior to the '85 season, and was angered when defensive player, Randy White signed for a large contract. When the USFL folded, and Herschel was signed by the Cowboys to a $5 million, five year deal, Dorsett went public with his complaints. He was getting less. $4.5 million to be exact, for the same number of years. Having brought a Super Bowl win to Dallas in his rookie year, Dorsett seems to have had a point. But at the time, Walker was younger, bigger, just as fast, if not faster; and more importantly, seemed to fit the image of the Cowboys, wherein, you just shut up, and do your job. Reportedly, Dorsett liked Walker on a personal level, but couldn't tolerate what he considered being disrespected by the Cowboys. On November 22, 1987, things came to a head when Dorsett was essentially benched in a game against the Miami Dolphins, for the first time in his career. He quickly demanded to be traded, and soon got his wish. After 11 seasons with Dallas, he was traded to the Denver Broncos. He played parts of the next two seasons with the Broncos, but injuries limited his production, and he retired not long after, in what was a Hall of Fame career. Herschel became the feature back for Dallas, and would lead the team in rushing the next two seasons, before leaving for Minnesota in the infamous trade that built the Dallas dynasty in the 1990's.